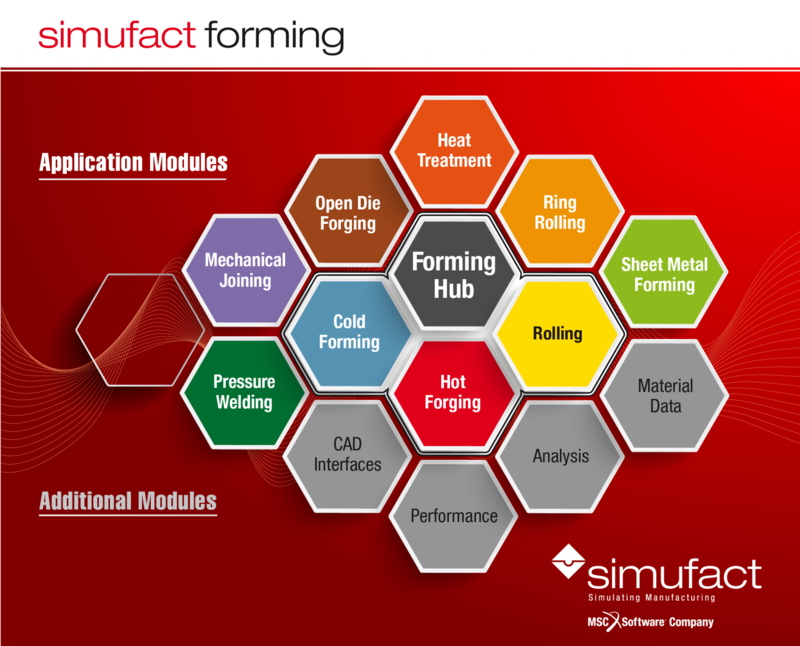 Our modular product line Simufact Forming offers the appropriate functionality for any forming process. With the module Heat Treatment, Simufact Forming gives you a unique option for the simulation of heat treatment processes that allows you to define the necessary parameters easily and quickly. The Simufact Forming Open Die Forging application module offers simulation of open die forging processes such as cogging, radial forging, rotary swaging, shell forging, forging over mandrels, partial rotary forging, and custom defined processes. The Ring Rolling application module simulates ring rolling processes, e.g. ring expansion, axial rolling or wheel rolling, profiled rings or rings with a rectangular cross-section, for cold or hot rolling processes. The Mechanical Joining application module simulates mechanical joining processes. These include riveting processes such as punch riveting, self-piercing riveting or blind riveting as well as clinching techniques. All application modules require the functions provided by the central Forming Hub. Among the pressure welding processes that Simufact can model are resistance spot welding, friction welding and friction spot welding. Simufact offers an independent application module for resistance spot welding processes often used in the automotive sector. 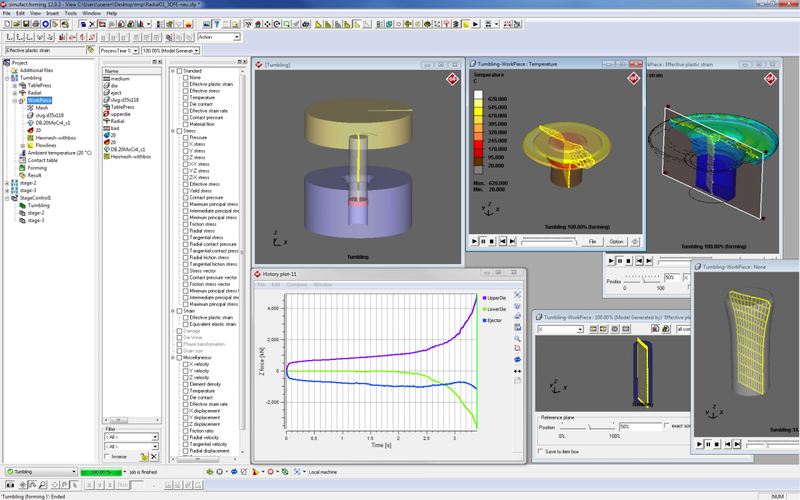 Analysis contains Simufact Forming Die Analysis, a module for die analysis that allows for a detailed view into the inner stresses of the dies. Simufact.forming Microstructure Matilda is a special module for the microstructure computations of steel and nickel-based alloys, based on “MatILDa”. This group covers additional technologies that increase the performance of your simulation solution. Simufact Forming Parallel Core allows parallel computations that increase the simulation speed, while Simufact.forming Additional Job enables you to run simulations simultaneously. Our CAD interface helps you to import geometries from native CAD data effortlessly. There are interfaces available for the most important CAD systems and formats, such as STEP, VDA, DXF, ACIS, Parasolid, CATIA V4, CATIA V5, PTC Creo (formerly Pro/ENGINEER), NX (formerly Unigraphics), SolidWorks, and Inventor. 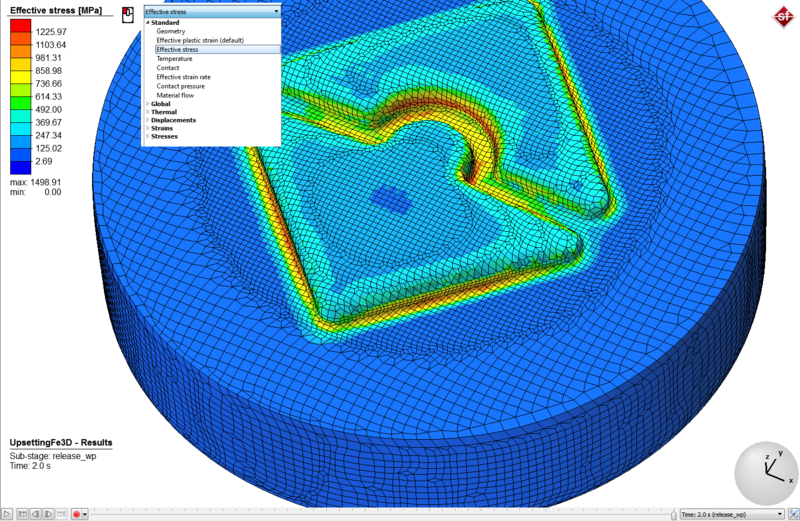 Two highlights in Simufact Forming 15 let beat the hearts of forming users faster: inductive heating and case hardening. Familiarize yourself with the top key features of Simufact Forming 15. 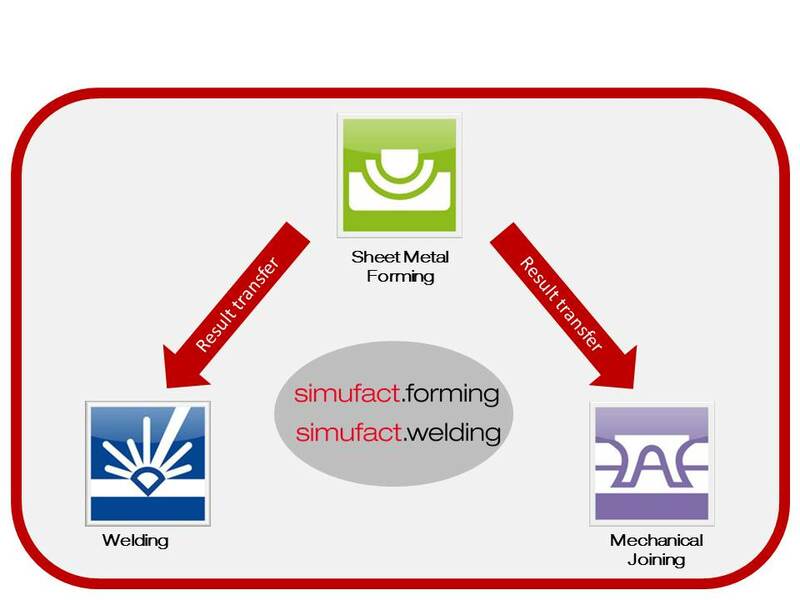 Simufact Forming is a simulation tool for hands-on professionals working with forming technology. Our goal is to focus the software to the practical needs of the users. Our customers confirm the fact that we have achieved a lot in this field. The operation of simulation software very often requires a lot of expert knowledge to build up and program complex models. This is not the case with Simufact Forming: The user can focus on the engineering-related details of the forming process. He does not have to deal with the physics of the forming process, nor with simulation-specific details. Simufact Forming is application-oriented as well as easy and fast to master. Simufact Forming’s standard user interface allows for the software to be easily used and therefore, to become an engineering tool for developers of dies or processes whose daily work is supported and simplified. With a few clicks, all standard-forming processes can be simulated and evaluated. Extremely easy to generate model variants. What do you want to achieve with your process simulation? With product version 12, Simufact has introduced the newly developed AFS technology (Application Function Sets). AFS provides specific process-dependent configuration such as the choice of the right solver, the meshing technology, process-specific kinematics and advanced settings. Application-specific functions are activated and the software focuses on the process-relevant functions while hiding those functions specific to other application areas. The new AFS technology means access to the simulation is more intuitive, faster, and more affective. Please note that Simufact Forming’s application modules are secured by licenses. We will be happy to advice you on which combination of modules is best to simulate your manufacturing processes. For further information, please refer to our sales contacts. Simufact Forming 14 comes with a newly developed GUI operation concept: Highly interactive context-related user dialogs allow a direct access to all relevant settings, which provides a completely new handling experience. Users benefit from an ease-of-use modelling procedure via mouse or touchpad, and finally a higher productivity in results evaluation. The thermodynamics of the process, workpiece heating, heat transfer into the dies and into the environment, temperature increase due to forming energy, friction heat, etc. "As easy as possible – as complex as necessary"
The complexity and precision of the simulation model can be increased, if necessary. For example, single pre-defined model parameters can be replaced by measured values. A multitude of further functions allows the experienced user to model all conceivable processes, however complex they may be. For experts, user interfaces are provided to enable an adjustment of the calculation algorithms, e.g. for research purposes. Mature solver technologies, with the highest precision of reproducing the relevant physical effects, contribute substantially to the high quality of Simufact Forming’s simulation results. A finite-elements solver, based on MSC´s implicit Marc solver for nonlinear applications, is used to simulate all process types. Both solvers have continuously been developed by MSC over the past decades and make it possible to reproduce the complex, nonlinear physics of forming processes with the highest precision. These solver technologies offer the utmost precision in result by the use thermo-mechanical, elasto-plastic element formulation. Besides the quality of the results, in practice the computation time is another especially relevant quality criteria. Only short computation times make the use of simulation software relevant for daily work. Simufact offers the efficient parallelization of simulation with its additional Performance module: The use of the highly effective methods, domain decomposition method (DDM) for the FE solver and shared memory parallelization (SMP) for FE and FV solvers, allows the computation time to be effectively decreased. Simufact Forming allows for both two-dimensional (axisymmetric and planar) and three-dimensional simulations on the same graphical user interface. Three-dimensional simulations can use symmetries of the real process (cyclic symmetries as well!) to effectively reduce model size and computation effort. Any kind of transition from two- to three-dimensions, with or without symmetries, is possible. All temperatures, from room temperature to almost melting point, can be simulated. The simulation always takes into account (even for cold forming processes) dissipation and friction heat, as well as the heat transfer with dies and the environment. In addition to this, typical tool steels for the characterization of elastic dies are included, too. The recrystallization behavior of steel and nickel based alloys can be examined with the module Microstructure Matilda. All forming machines common to forming technology can be simulated. The user can describe special kinematics in table format. 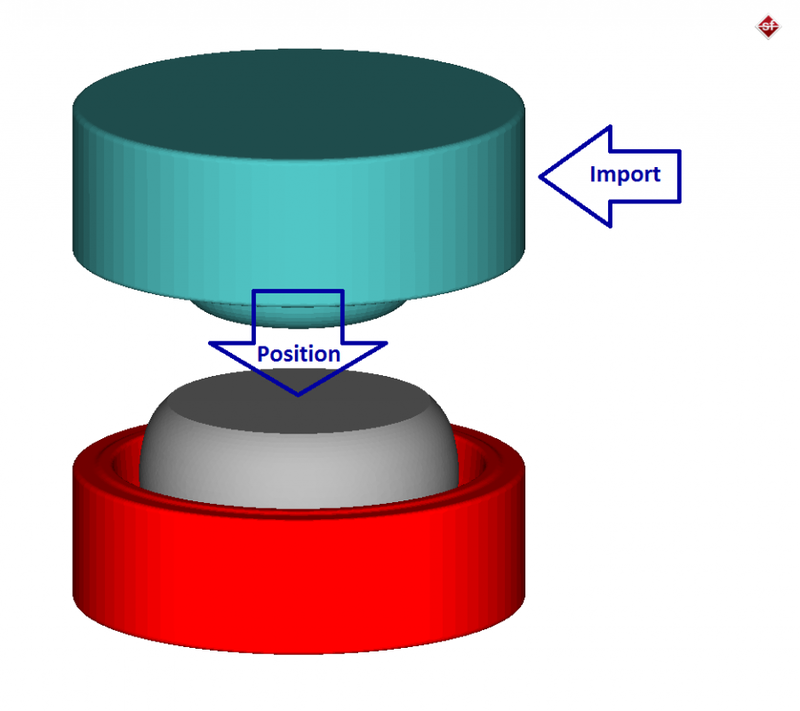 Rotating tools are simulated by the Rolling module. Simufact Forming simulates closed loop controlled aggregates such as those used for ring rolling or open die forging with the respective application modules. MAGMA and Simufact are pushing forward the integrated simulation of the entire process chain. Read more about the new interface between casting process and forming simulation in this White Paper. All relevant auxiliary processes, such as pre- and intermediate heating, deburring and cooling processes can be simulated closely related to real life. Simufact Forming has a modular architecture. The modular concept of Simufact’s products helps you to choose the relevant functions for your needs. This approach saves you costs and gives you the flexibility to adapt to changing requirements. With its application modules, the software line offers process-specific functions for all the relevant application areas of forming simulation. The modules’ functions enable the simulation of single manufacturing steps and can be combined to simulate entire process chains. Additional modules offer you a whole range of further valuable functions for the daily use of the software.